Tuesday, 19 January, 2016: Weekly Study Group commences again for 2016 (open to all members and committee members, contact us for more info). 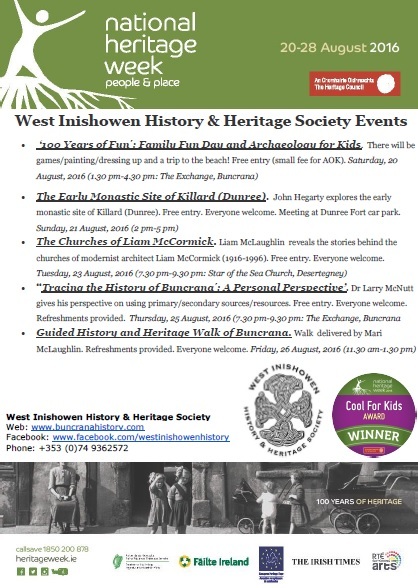 Tuesday, 2 February, 2016: Launch of West Inishowen History & Heritage Society 2016 Newsletter. 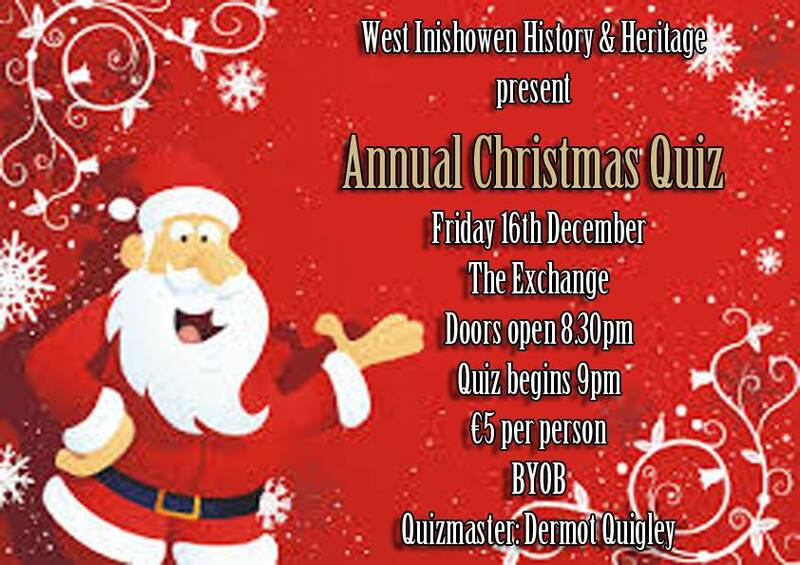 Thursday, 4 February, 2016: West Inishowen History & Heritage Society Annual General Meeting, 8pm upstairs in the Exchange, Castle Avenue, Buncrana. All welcome. Hear about the major achievements of 2015 including our National Heritage Week Award plus some of the exciting plans for 2016. Become a member and benefit from a range of members-only trips and events. Refreshments will be provided. Wednesday, 9 March, 2016 (6.30 pm – 9.00 pm): Committee members traveling to Donegal Public Participation Network’s AGM in Letterkenny (as agreed at committee meeting – not open to the public invite only). 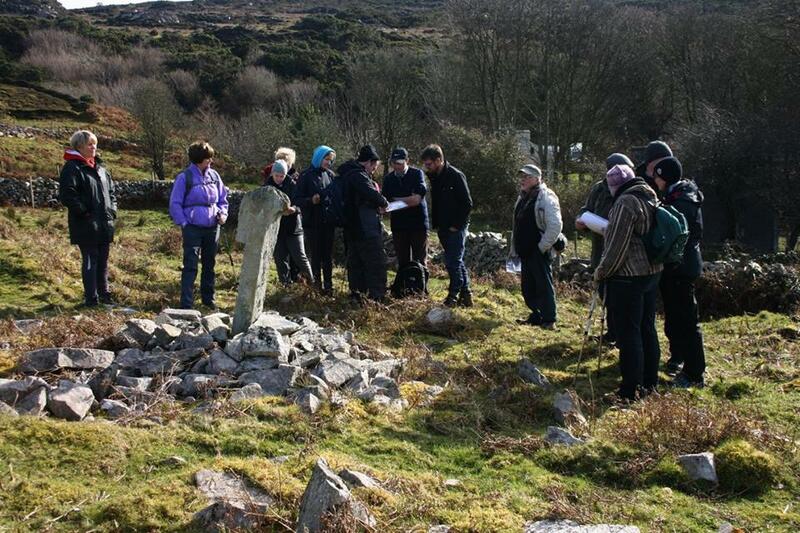 Saturday, 12 March, 2016: Early Medieval Christian Site Field Walk and Research. 12 midday [committee members event]. Saturday, 16 April, 2016 (The Plaza, Main Street, Buncrana: all day): Bank of Ireland: Buncrana Enterprise Town. Come along and get further information on the work of WIH&HS or sign up to become a member of the society at our stall in the restored ballroom of the Plaza, Buncrana. All welcome! More info available here and here. 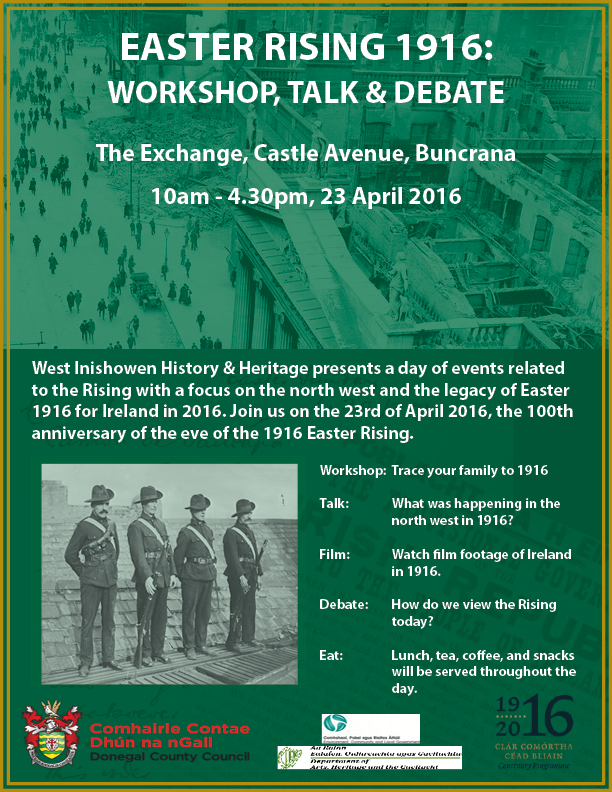 Saturday, 23 April, 2016 (10.00 am-4.30 pm): Easter Rising 1916: Workshop, lecture and debate to mark the centenary. The Exchange, Castle Avenue, Buncrana. 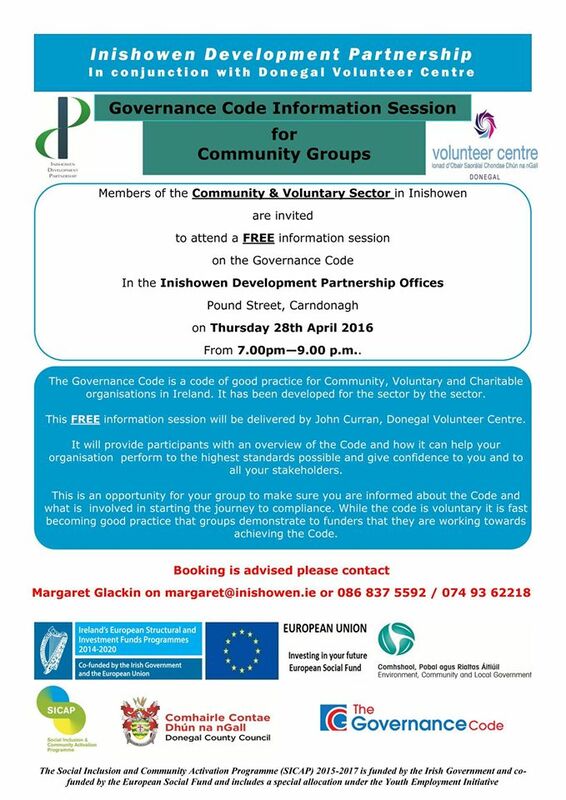 To sign up for this free event please click here. For more information please see our Facebook page here. All welcome! 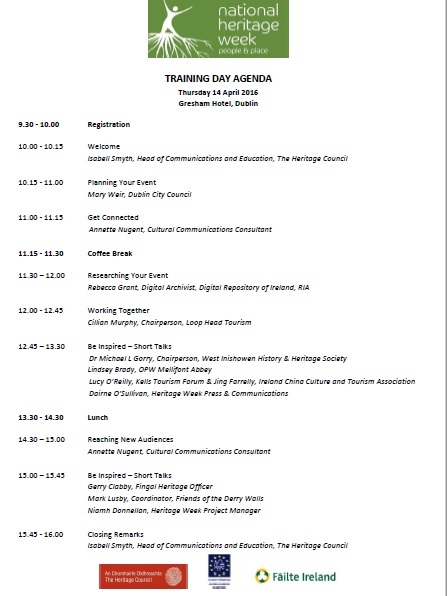 Thursday, 16 June, 2016: Committee Members Traveling to National Heritage Council HQ Kilkenny to collect national award for their 2015 National Heritage Week event (WIHHS Family Fun Day). 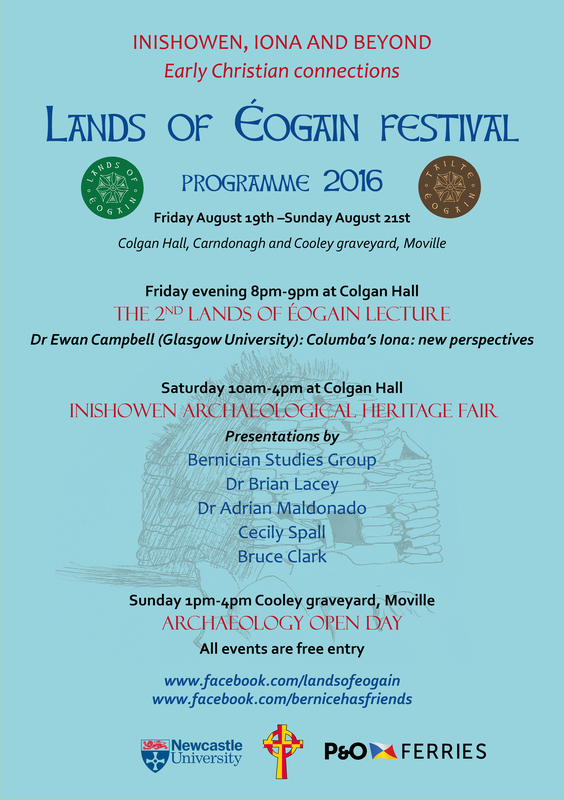 Saturday, 23 July, 2016: Festival of Archaeology 2016: Guildhall (Derry~Londonderry) on Sat 23rd July 2016 (10:00-17:00). 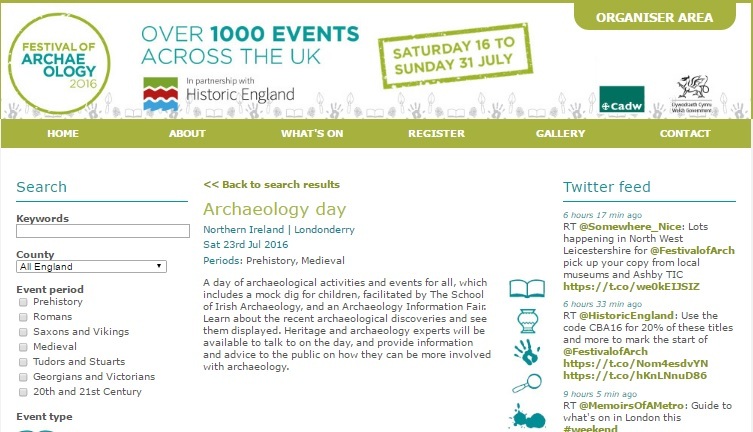 ‘A day of archaeological activities and events for all, which includes a mock dig for children, facilitated by The School of Irish Archaeology, and an Archaeology Information Fair. For more information regarding our role please click here or visit the main website here. Join WIH&HS (in conjunction with the Tower Museum/Derry and Strabane Council) as we launch the Mabel Colhoun collection in the Guildhall. Guest of honour will be the mayor of Derry and Mabel Colhoun’s niece. 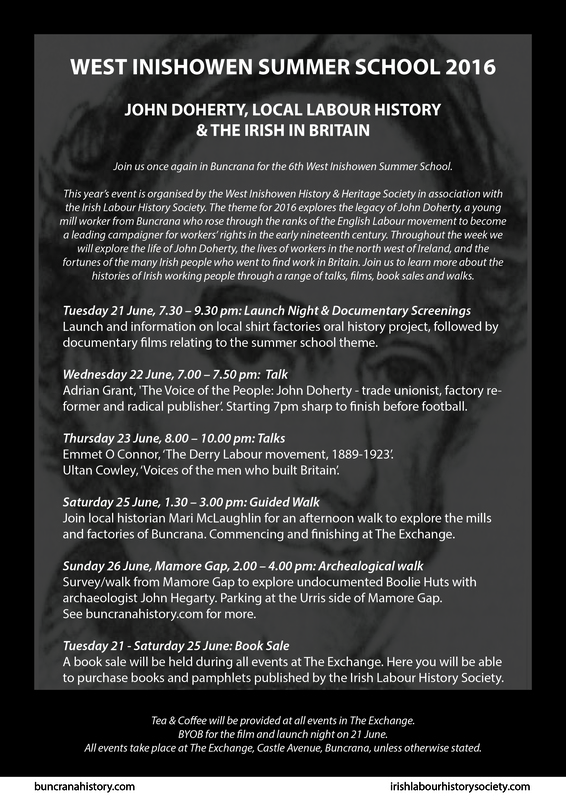 Saturday, 30 August, 2016: Buncrana Guided Heritage Tour, our very own Mari McLaughlin (in conjunction with Buncrana Library) will give the second of her excellent history & heritage walks as part of NHW. Join her at 11 am sharp outside the library. Saturday & Sunday, 2 – 4 December, 2016: Buncrana Christmas Tree Festival. Come to Buncrana to tour over 40 bespoke Christmas trees which were commissioned especially for this charity event. You can view our awesome local history inspired WIH&HS Christmas Tree in St Mary’s Oratory, Buncrana (view our tree here). Open daily 11 am – 7 pm. More information available here. Thursday, 02 February, 7.30 pm (The Exchange, Buncrana), WIH&HS AGM, all welcome!